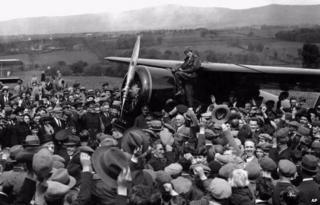 Northern Ireland's unlikely part in aviation history is being revisited in a startling archive radio interview with one of the first people on the scene. In 1932, Amelia Earhart took off from Newfoundland in Canada in a bid to become the first woman to fly solo across the Atlantic. She hoped to land in Paris, but bad weather and technical problems altered her course and instead, after a flight lasting almost 15 hours, she landed near Londonderry in the Gallagher family's field. Mrs Gallagher would speak to the BBC three years later to tell of what happened on that hot Saturday afternoon when their uninvited transatlantic visitor dropped in with no money or luggage. That interview has been unearthed by Time of Our Lives, a BBC Radio Ulster programme about the life stories, experiences and ambitions of older people in Northern Ireland. While the recording is not of the highest quality, it is still clear enough to get a good picture of what happened when a family was sitting out in the garden "on one of those lovely hot afternoons that you sometimes get in May". She describes how they saw a plane circling very low over their house before landing in a big field at the back of the house. While her husband and children raced towards the plane along with some farm workers, Mrs Gallagher was as unflappable as the pioneering aviator. "The afternoon was hot and I felt lazy, so I'm afraid I didn't pay very much attention to it - I was too comfortable where I was," she said. "The first farmhand who got to the aeroplane saw that there was a woman in it and asked her where she'd come from - she said 'America'. "I didn't know about this until afterwards, so my curiosity got the better of me after a minute or two and I went up to the plane as well. "Standing beside it was a tousled-headed girl in trousers and leather coat. She didn't seem at all excited." After her long journey, the only thing Ms Earhart wanted was a telephone to tell her husband she had landed safely. While she was heading to call her husband, Mrs Gallagher said she went to cook her a meal and it turned out to be a good decision. "She said she hadn't had anything but tomato juice since she'd left America," she said. "We asked her to stay with us until she was ready to go on again, and she said she would so long as we didn't mind her clothes - she had nothing but what she stood up in. "In fact she had literally no luggage of any kind with her whatever, and no money either - but my husband was able to fix that." Looking back on that afternoon, Mrs Gallagher said she "thoroughly enjoyed having our very unexpected guest". "I can still hear her nice matter-of-fact voice saying about her flight, as though it had been rather a long motor drive on a cold day." In the same year that Mrs Gallagher gave her eyewitness account of her encounter with Ms Earhart, the aviator became the first person to fly solo across the Pacific Ocean from Honolulu to Oakland, California. In 1937, she set herself the challenge of being the first woman to fly around the world. This challenge, however, would prove too great and she disappeared after taking off from Lae New Guinea, bound for Howland Island in the middle of the Pacific Ocean. A rescue attempt lasted 17 days and scoured more than 250,000 square miles of ocean, but she was never found. The aviator remains a household name in the US, and an airport in her home state of Kansas was named in her honour. In March 2012, a similar bid to rename City of Derry Airport after her was rejected when local politicians could not agree.